I'm preparing to attend the Kansas Art Education Association fall conference later this week, and though it falls on Parent Teacher conferences for me this year, most of the time art teachers are thinking about sub plans. Most of the time I just try to make sure my intro classes have their new "projects" going (independent exploration after a boot camp or a themed challenge) and my advanced students are almost always working on their own projects so that I can just write "the students are working on their own projects and should know what to do" and leave notes on any behavioral FYIs. 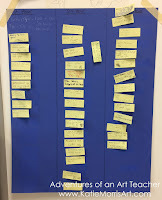 Some of the techniques I've used in the past to hold students accountable for their work in my absence are a short survey on Google Forms or a post-it note the students fill out with their name, what they worked on, and a score of 1-10 with how engaged (on-task) they were that day. Super focused- I got a lot accomplished and was on task the whole time. Mostly focused- I got stuff done but spent some extra time talking. Not that focused- I made some progress but spent more time talking or off task than I should have. Not focused at all- I hardly got anything done and was off task most of the time. 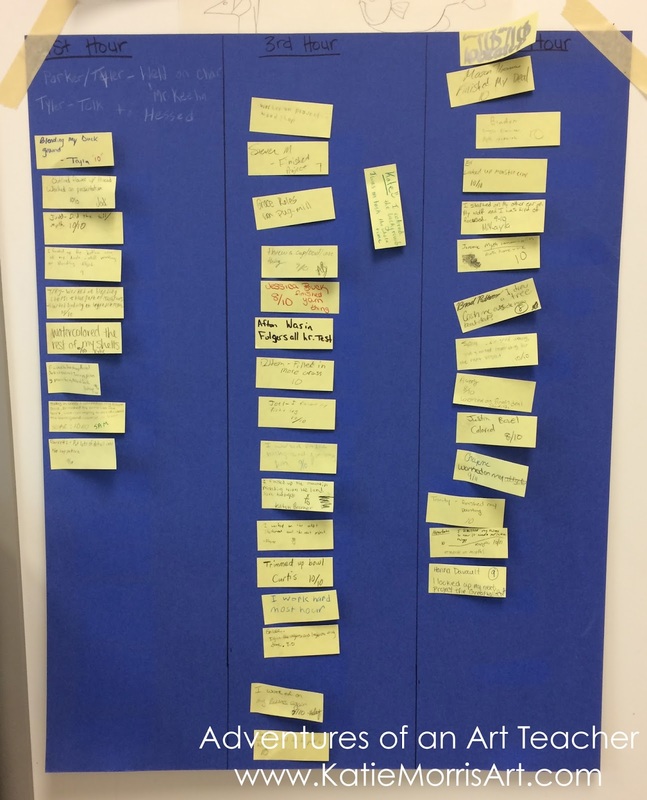 Sometimes, you may need a sub plan that is different than what the students regularly work on. After some of my art teacher friends and I brainstormed a list of sub plan ideas for high school, I figured I would share them here! Art Prof Art Dare- Each month the Art Prof (Clara Lieu and her partners) post a challenge, which is pretty interesting, and the older ones are archived as well. My students especially enjoyed the drawing challenge from February 2017 that had charts with interesting words for the artist to illustrate. I later made my own with different words to use with my middle school students. PBS Art Assignment- PBS digital studios produce some great content, such as the Art Assignment. Art Assignments introduce a contemporary artist, make connections to art history, and then challenge students to apply some of the ideas. Explore their channel! Scholastic Art- Have the students read one or more of the articles and complete the worksheets in the teacher resources. Or, ask the students to make a work of art in response to the featured artist/movement or the student spotlights. Inktober- Find a seasonal art challenge. In October, lots of people participate in "Inktober". I need to start! I've seen several more pop up at different times of the year. Illustration Friday- Each week there is a new topic in the weekly art challenge. You can see how artists/illustrators have used different styles and mediums to complete the task. Your students can take on the challenge, too! Artprompts.org- Click on a category such as character, creature, environment, object, situation, or challenge and get a random selection from a huge database. Don't like it? Keep refreshing until you get something that resonates with you. You can even submit your own ideas. Students can use their prompt as a starting point for a sketch or finished work. Art 21- "Art21 is a nonprofit organization dedicated to inspiring a more creative world through the works and words of contemporary artists." Have the sub show a video and then students could write a response, do visual journaling, answer some questions, or whatever you decide! What easy ideas do you use for secondary art subs?